Stop Explosive Investments is a successful sub-campaign of the international Cluster Munition Coalition (CMC) tackling investment in the production of cluster munitions. The campaign is led in partnership by the CMC and its member organization PAX (the Netherlands). The goals of the campaign are to end financial investment in cluster munition producers and urge states to take a stand against investment in cluster munitions. In addition to ending financial investment in cluster munitions producers, the campaign facilitates engagement on the broader cluster munitions issue with the public, governments and the media as a way of continuous stigmatization of the weapon and promotion of the norm that is in the Convention on Cluster Munitions. 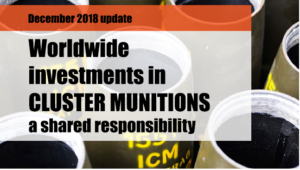 Since 2009, the SEI campaign regularly publishes an update of the Worldwide Investments in Cluster Munitions report. The latest update of that report can be downloaded here. If you wish to stay informed about the campaign, please click here or send us an e-mail at info@stopexplosiveinvestments.org.